Most primary and secondary schools in Western countries test their students' intelligence every few years by administering a written IQ test. 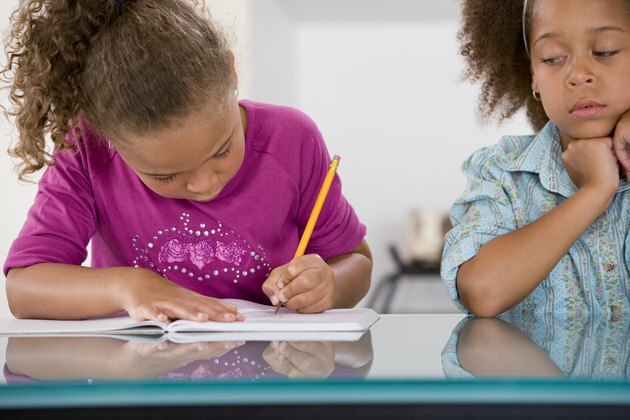 The results of these tests may determine the level of educational opportunity a child receives. For this reason, it is important to understand what the IQ test is and how scores are calculated. In the 19th century, physical characteristics were commonly used to determine the intelligence of children, because physical abnormalities were thought to indicate inferior intelligence. In 1905, French psychologist Alfred Binet developed the first general intelligence test, according to the University of Michigan Department of Psychology. He was able to show a child's intelligence persisted across a wide range of mental abilities. For example, a child who excels at spatial reasoning is more likely than other children to excel at verbal reasoning as well. For this reason, he believed it appropriate to describe a child's intelligence by assigning a single number. This number has become known as the intelligence quotient (IQ). The IQ is, as its name indicates, a quotient -- the child's mental age divided by his chronological age, multiplied by 100, according to Dennis Garlick of the UCLA Department of Psychology. An IQ of 100 is defined as exactly average. The number of questions answered correctly on a given IQ test -- the raw score -- is averaged for children of different ages. The raw score of a particular child is then compared with these averages to determine the child's mental age. The IQ test measures a variety of mental abilities such as fluid reasoning, spatial reasoning and verbal intelligence. If a particular child's raw score on an IQ test is equal to the raw score of the average 12-year-old, the child is assigned a mental age of 12. The IQ of a 10-year-old with a mental age of 12 is (12/10) * 100 = 120. The IQ of a 15-year-old with a mental age of 12 is (12/15) * 100 = 80. Therefore, two children with the same raw scores on an IQ test can have very different IQ scores if they are of different ages. The purpose of this disparity is to compare children only with children of the same age to produce a measure of relative intelligence, so as to take into account the fact that a child's absolute intelligence increases until brain maturity at about the age of 16. The University of Maryland Medical Center has published widely-used categories that give significance to the IQ score. An IQ of below 70 is considered mentally retarded, while the average range is between 90 and 110. An IQ of 130 or more is considered gifted, while an IQ of between 145 and 160 is considered very gifted. An IQ of 165 or more indicates genius level. The highest IQ ever recorded is 228, attained by Marilyn vos Savant, an American woman. The IQ test has been criticized as oversimplified and racially biased. Evolutionary biologist Stephen Jay Gould asserted that, due to racial disparities in average IQs, it falsely supports a scientific-sounding justification for racism. Ms. vos Savant herself says intelligence involves so many factors that efforts to measure it are useless.